Here are some facts about bread. Bread remains one of the UK’s favourite foods, with 99% of households buying bread – or the equivalent of nearly 12 million loaves are sold each day. Each year 99 bread products are purchased per household. Men eat bread more frequently than women: 44% of men eat bread twice a day compared with 25% of women. White bread accounts for 76% of the bread sold in the UK. Large bakeries, which produce wrapped and sliced bread, account for 80% of UK bread production. In store bakeries produce about 17% of bread, with the remainder accounted for by High Street bakeries. Bread is wrapped and sliced for convenience, for keeping qualities and value for money. Otto Frederick Rohwedder invented the first slice-and-wrap bread machine in 1928. He sold his pre-sliced, wrapped bread in a bakery at Battle Creek, Michigan. By 1933 80% of all bread sold in the US was sliced and wrapped and the phrase ‘the best thing since sliced bread’ was coined. Sliced bread was first introduced into the UK in the 1930s. Over 200 different kinds of bread are produced in the UK – from butter rich brioche and crisp baguettes to farmhouse loaves and focaccia, soft ciabatta and crumpets to chapattis and flaky croissants. This diversity is only possible because of the vast range and quality of British flour available. 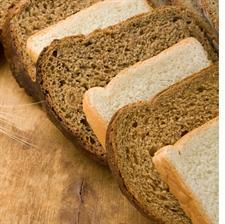 Our page on different types of bread lists more varieties see here. Sandwiches account for 50% of bread consumption; whether bought or made-at-home. Despite being a staple food in the UK for centuries, bread consumption has fallen steadily over the last few decades. Average consumption now equates to only around 2-3 slices of bread a day. As well as providing energy, mainly in the form of starch, bread contains dietary fibre and a range of vitamins and minerals. Analysis of the UK Government’s National Diet and Nutrition Survey (NDNS) in 2012 suggests that bread still contributes more than 10% of an adult’s daily intake of protein, thiamine, niacin, folate, iron, zinc, copper and magnesium; 20% of our fibre and calcium intake; and more than 25% of our manganese intake. Therefore, eating bread can help consumers to meet their daily requirements for many nutrients, including micronutrients for which there is evidence of low intake in some groups in the UK, such as zinc and calcium. For more information on the baking industry in the UK, please visit www.bakersfederation.org.uk.